Biographies pending for Prof. Maraylyn Druce, Prof. Tahseen Chowdhury, Dr Paul Greaves, Dr Edward Bettany, Dr Amy MacBrayne, Dr Amy Rickard, Dr Rose Ingleton, Dr Georgie Elliot and Dr Nithish Jayakumar. Dr Adam Feather has seemingly been forever present in finalists' revision plans. Having dragged an incredible 16 years of students through “Feather Does Finals” he has finally decided to hand over the reins. He has been instrumental in formulating the Simply course and we are delighted that he will be returning to give an overview of general medicine on this year's course. Dr Feather works as a Consultant Physician at The Royal London Hospital. We are truly honoured to have Professor Kumar taking the floor to lead our cases in gastroenterology and hepatobiliary medicine. Her illustrious CV is known to many. She has been the president of the BMA and the Royal Society of Medicine and was also a past vice-president of the Royal College of Physicians. She has held a number of other posts within NICE, the Medicines Commission and the British Society of Gastroenterology. She is well-known for co-editing Kumar and Clark's Clinical Medicine, as well as as a range of other medical textbooks. Perhaps most importantly, however, she too led a revision course for Barts students when she was a junior doctor! We are honoured to have Prof. Warrens, BL’s Dean for Education lecture on the course. He did his undergraduate studies in Immunology and Medicine at Glasgow and Oxford Universities, respectively. He has also worked at the Massacheusetts General Hospital, part of Harvard Medical School, and the Hammersmith Hospital. He is currently a consultant renal physician at The Royal London Hospital and a former president of the British Transplantation Society. Mr Brecknell is a Consultant Neurosurgeon at Queen's Hospital and is currently in the process of adding even more letters after his name by doing a Masters in Clinical Education. He is also the head of final year at Barts and The London. Furthermore, he's the co-chair of the core surgical training committee for London. He is a keen singer, having sung bass in a number of choirs. He has also undertaken triple-jumping, rugby and running on the sporting front. Of note, he attended the same school (Canford) as Dr Dooley in Dorset! Dr Joshi studied medicine at Oxford because his parents told him to, graduating in 2008. Since then he's been climbing the broken career ladder in London and became a cardiologist after some late-night Googling. He currently tries to make esoteric diagnoses from badly faxed ECGs and third hand histories. In his spare time he plays the bass guitar and video games. Dr Ricketts is a Consultant in Respiratory Medicine at St. Bartholmoew's Hospital. He holds an honorary lecturer position at Barts and The London SMD where he regularly lectures on the CR3 lecture programme. He has a strong background in teaching clinical skills and in 'diagnostic reasoning', the subject of his Masters dissertation. When not working Will enjoys playing and watching football (he once captained St George's first XI, but don't hold that against him) and looking after his pet chicken, Marilyn! Barts and The London born and bread, having graduated in 2006, Mr Fleming is warmly welcomed back to teach for Simply Finals. He has postgraduate qualifications in both surgery and medical education and holds an international lecturer post in Australia. He has published widely, both academic and in medical education, including numerous articles and books. We are delighted to have him delivering the Simply Surgery lecture session. Dr Dias is a consultant gastroenterologist an Newham University Hospital. He was born in Sri Lanka but spent most of his life growing up in Kent. He did his first degree in psychology at UCL before studying medicine at Guys & St Thomas'. Whilst a registrar he was a teaching fellow at Newham for 3 years and helped create the data interpretation exam for 3rd year students. He became a consultant in August 2010 and he specialises in hepatology. 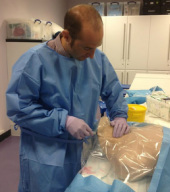 He has written and edited 3 MRCP books as well as written review articles on bowel cancer, hepatitis B and hepatitis C. He is married to an anaesthetist and has 2 daughters. He is a supporter of Tottenham Hotspur and so is used to disappointment and having low expectations. His main hobby is learning Spanish at an incredibly slow rate if only to understand his wife, children and in-laws. Paul is a consultant haematologist at Queens Hospital in Romford with an interest in haematological malignancy and medical education. After qualifying from Cambridge and UCL, training at Bartd and The London and spending four years in researching T cells and Hodgkin lymphoma at QMUL, he came out with a PhD, but abandoned laboratory research in favour of clinical and educational work. Dr Alice Thomas - Core Skills and Data Interp. Dr Alice Thomas is currently a Core Medical Trainee working at Newham University Hospital. She studied at Barts and The London, during which time she was actively involved in dance and netball, qualifying in 2013. She has a keen interest in medical education in various realms, including the organisation of postgraduate study days. She is currently undertaking a Masters degree in the subject. We're pleased to welcome her to the Simply team. Mr Vulliamy graduated from Newcastle University in 2009, before heading to east London where he has trained since then. He is currently a registrar in general surgery, although continues to be mistaken for a third-year medical student by patients and colleagues on a regular basis (hopefully because of his youthful features rather than clinical acumen). In his spare time he plays guitar, takes photos of stuff and occasionally turns up for Sunday league football. Dr Gouveia is an Endocrine and Diabetes registrar and Clinical Teaching Fellow at Newham University Hospital. She takes a lead role in the organisation and teaching of undergraduate students at Newham and is pursuing postgraduate qualifications in medical education. Dr Hanson trained at Barts and The London and is currently a consultant in Endocrinology and Diabetes at Newham University Hospital. She is the author for the Endocrine chapters in Kumar and Clark’s Medical Therapeutics and a member of the writing group for guidelines relating to the management of HHS for the Joint British Diabetes Societies. She has taught extensively on undergraduate and postgraduate courses at BL, as well as for PasTest, so we are very pleased she can lecture on the Simply Finals course.